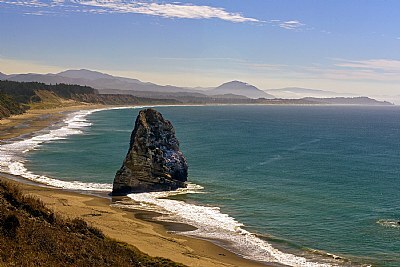 About The beach is located in Cape Blanco State Park on the Pacific Coast of southwest Oregon. At the westernmost tip of the cape sits a lighthouse that began operating in 1870. The state park offers camping, hiking, fishing and, of course, beach access. And, being the westernmost point in Oregon, Cape Blanco boasts breathtaking views. A beautifully balanced composition with lovely tones and excellent depth. A richly deserved award.